Getting a delivery quote or transportation or house removal estimates from MoveSavers is simple and straightforward. There are lots of amazing things customers can benefit from using MoveSavers. We have listed 6 benefits below. You save money: As a user, you save money when you compare delivery, removal or transportation quotes. When buying car insurance or utility most people use comparison websites to compare quotes. You should do the same when looking for delivery quotes. You get professional transporters: You have spent ages, collecting vital and precious items. Now it is time for you to move, and perhaps you are wondering what to do? Relax, at MoveSavers we have professional transporters that can handle your precious items with care. Ensuring they are delivered the same way as collected. You tell us what want to deliver. We do the rest. Saving you time: Looking for transport or delivery company can be time-consuming. At MoveSavers, you only tell us what you want delivering and trusted companies provide quote for you to review at your leisure. Yellow pages, Gumtree, back pages of your local paper? They are so old school! Tailored delivery just for you: Imagine, you have something to be transported, it must be collected and delivered at a specific time and date. Who do you go to? Royal mail? Parcel Force? DHL? Hell no! 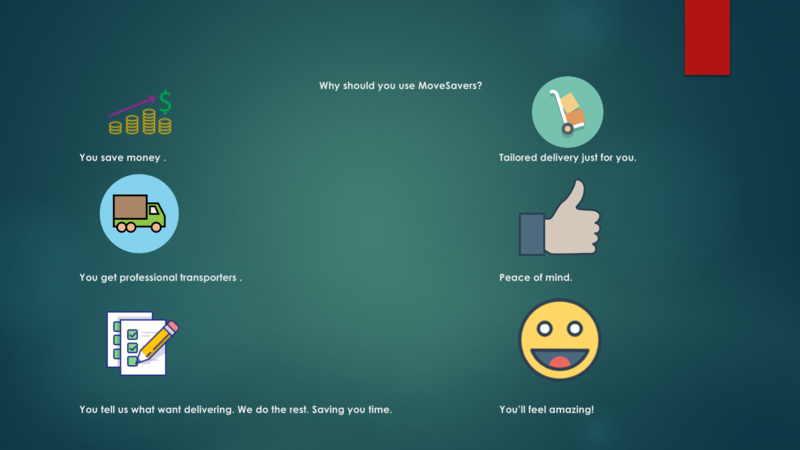 You go to MoveSavers, tell us when you want the item collected and delivered. Do you need storage? Let out transporters know; this is the only true Tailored Delivery! Peace of mind: Oh! We have seen it everywhere!! You receive a quote from a so called man with a van on the internet somewhere. You sat and waited for your item to be delivered, nothing. Perhaps you took some day off work to receive your item but got nothing. You rang the company no answer; you empathically tried again and again nothing. Finally, it dawns on you that you have may have been swindled. Unfortunately, you can’t trace the company. At MoveSavers, we only use vetted company with traceable history for your peace of mind.